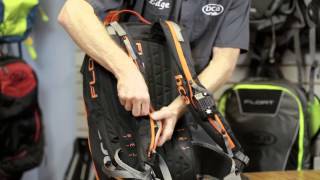 The Float 25L Turbo from BCA is their most technical avalanche airbag pack for mountain sledding. Features integration for BC Link radios, hydration sleeve, left or right side trigger mount, fixed leg strap, internal and external shovel attachment, dedicated shovel/probe sleeves, dry main compartment, multiple internal pockets, storm zipper flaps, heavy-duty ballistic nylon base, compression formed back panel with internal support stay, height adjustable waist belt for torso length, dual hip belt pockets, and fleece lined goggle pocket. If you are a backcountry snowmobiler, this avalanche airbag pack is for you.